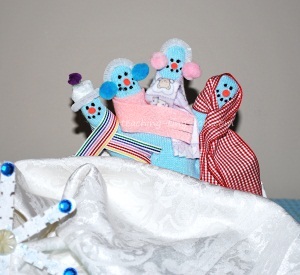 DESCRIPTION Toddler Activities: Turn a mitten into a snow family with some paint and fabric. This is a craft that the girls saw in a picture when we were looking for ideas and were so excited to make one of our own. Fill a mitten with tissue paper to make it easier to decorate. If your child can dot the eyes and mouth with paint, an easy way to guide them is to place dots with a Sharpie Pen to mark the eyes and mouth. Be sure to leave room for the nose. Squeeze a few drops of black paint onto plastic palette or on a small paper plate. Dip flat toothpick or craft stick into paint and follow the dots made by the Sharpie. While the paint is drying on the mitten, cut felt or material into strips about one inch wide and about 6-8 inches long. It will vary in length according to how you wrap it around the neck of the snow man. If you are going to tie it instead of wrapping, add a couple inches. Cut a piece of pipe cleaner about one inch long bend around adult finger to shape into a curve and glue a small pom pom on each end. The hat is tricky to make. Cut a strip of felt about 1.75 inches long by .75 inches wide. Wrap around adult pointer finger as if you have a small cut on the tip of your finger. Put a drop of glue on the felt and secure. With half of the circle of felt above your finger tip, fold down edge, put a small drop of glue and fold the next edge until all edges are folded down. Glue small pom pom on top. When eyes and mouth are dry, glue on nose. Glue on scarves, ear muffs and hats. Shop early for mittens! We wanted a white one but by January stores are starting to bring in Spring Clothing and we ended up with a turquoise one! Omit hat if it is too tricky and make another set of ear muffs. For the rainbow scarf we used 1/2 inch grosgrain ribbon. For the hooded scarf we used 1 1/8 inch wired microcheck ribbon which is easy to shape. For the purple printed scarf we used a piece of scrap material from one of the dresses the girls outgrew. The pink scarf is a piece of felt. Use a child's size mitten or the snowman will have a very long body! A great way to introduce toddler activities are by reading a book with your child.